This beautiful 100% hand woven Persian Rug, by master weaver Mortazavi, originates in Isfahan, a renowned center for handcrafted works. The rug has a silk foundation and has been woven out of silk and wool. 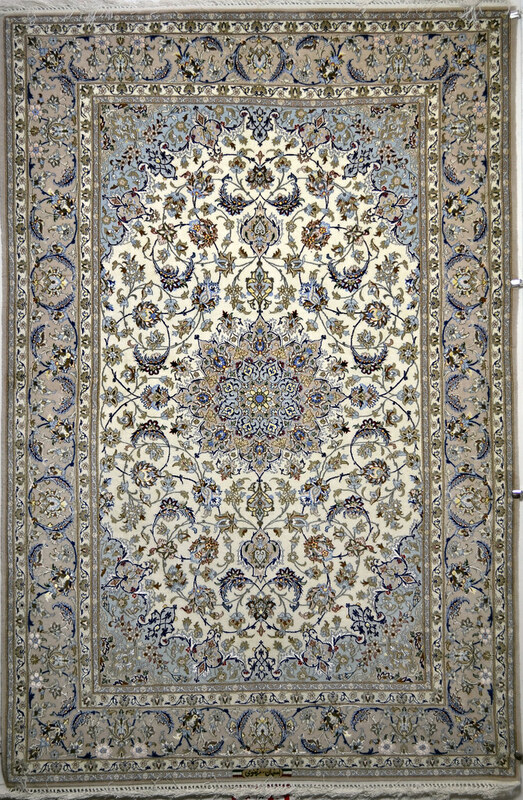 It is classed as a small Persian Rug (3x5-5x8), its size being 234 x 153 (cm), 7’8 x 5’0 (ft). It has a very pale beige background and a centered floral medallion. The colors of the motifs are pale mauve, soft purple, blue, light blue, navy blue, olive green, soft claret, etc. The border has a beige background and a floral pattern dominated by various shades of blue and brown.